« Before Jesus returns, might there be a ‘King of Jerusalem’? Steve Bannon built his career on right-wing politics inside the United States but now he’s taking on a new frontier: the European Parliament. Bannon described his plan to create a right-leaning foundation called “The Movement” to The Daily Beast. He plans to establish its headquarters in Brussels. The Movement, according to Bannon’s account, is envisioned as a non-profit organization that will serve as the right’s equivalent of George Soros’ Open Society. Bannon’s goal is to create a hub where the populist right can receive help with polling, research, voter targeting, policy proposals, and field operations among other efforts to help unite European populist groups. “Bannon is a malignant far-right rabble-rouser. In his case I agree, just this once, with the no immigration mob! Keep him out of Europe. He is a creature of Trump’s America! 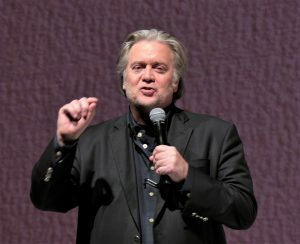 “The Movement” — that is the name of the radical right-wing operations center American nationalist Steve Bannon wants to plant in the heart of Europe, in Brussels. “The Movement” of all things! This cannot be a coincidence for the cunning chief strategist of anti-liberalism. Alarm bells should ring for Germans in particular, but for all other European citizens as well. But Bannon wants more. He clearly pictures a dissolution of the EU and an end to liberal democracy in Europe. Right-wing nationalists at the European level have been quite uncoordinated up to now. Bannon could change this with modern campaign logistics, social media, voter profiling with skimmed data and other tricks from the US election. He could actually set something like a European right-wing nationalist “movement” in motion, building on electoral successes in Italy, Austria and Germany. So, various ones believe that the EU is “under siege from English-speaking rightists,” Brexiters, Donald Trump, Steve Bannon, and others. They are concerned that English-speakers are threatening the very existence of the European Union. They are also comparing Steve Bannon’s movement to Adolf Hitler’s. Steve Bannon reportedly plans to spend about 50% of his time in Europe, mainly traveling around to promote the Movement. The EU does not like what Steve Bannon is doing. Nor do I believe that Steve Bannon will be pleased with what Europe will become. The Beast of Revelation 13 and the “he” of Daniel 11:39 is a European leader, also called the King of the North in Daniel 11:40. Notice that Daniel 11:39 states that the strongest military power–which currently is the USA (and to a lessor degree, its Anglo-Saxon descended allies)–will be taken over. The Europeans are mad at the USA for many reasons (including its President Trump), the UK for the Brexit vote, and will decide that places like Canada are too connected to them to remain. Steve Bannon’s direct efforts to undermine the European Union are also not pleasing to the EU leadership. Did you know that Roman and Eastern Orthodox Catholic prophecies also tell of a time when a European leader will defeat the English-speakers? Well, while the Bible warns against the coming European King of the North Beast power, many Catholic prophecies look forward to this leader, under the name of The Great Monarch. Saint Cataldus of Tarentino (c. 500): “The Great Monarch will be in war till he is forty years of age …. he will assemble great armies and expel tyrants from his empire. He will conquer England and other island empires” (Connor, p.30). St. Columbine (d. 597): The enemies of the English shall be aroused in battle–they who reside in the eastern and western parts of the world … the English shall be defeated … After the English shall be defeated in this battle, they shall be harassed by every quarter; like a fawn surrounded by a pack of voracious hounds, shall be the position of the English amidst their enemies. The English afterwards shall dwindle down to a disreputable people (Culleton, R. Gerald. The Prophets and Our Times. Nihil Obstat: L. Arvin. Imprimatur: Philip G. Scher, Bishop of Monterey-Fresno, November 15, 1941. Reprint 1974, TAN Books, Rockford (IL), pp. 131,132). Note: it is possible that the “capital of the world” above being referred to is Washington D.C. or the United States of America. Also note that England was not known by that name in the 500s, hence the prophecy that mentions it would have used a different term in its original language that the Catholic translator apparently has concluded is modern England or those who are/speak English. St. Senanus (d. 560): They (English) themselves will betray each other: in consequence their sovereignty will be broken … One monarch will rule in Ireland over the English (Culleton, p. 128). So, a betrayal of Ephraim and Manasseh/Samaria, English-speaking nations in the 21st century, is in Bible prophecy. Many in Judah (the modern nation of Israel) also speak English. For information on the modern identities of each of the tribes of Israel, check out the article Anglo – America in Prophecy & the Lost Tribes of Israel. Mother Shipton (d. 1551) “The time will come when England shall tremble and quake … London shall be destroyed forever after . . . and then York shall be London and the Kingdom governed by three Lords appointed by a Royal Great monarch … who will set England right and drive out heresy (Culleton, p. 163). Telesphorus of Cozensa (16th century). “A powerful French Monarch and French Pope will regain the Holy Land after terrible wars in Europe. They will convert the world and bring universal peace …” (Dupont, p. 31). Priest Nectou (d. 1772): … when England shall begin to wane in power, the destruction of Paris shall be at hand. This shall be a sign. England shall, in her turn, suffer a more frightful revolution than that of France (Culleton, p. 176). Various Catholic prophecies suggest problems for France/Paris before the Great Monarch gains power. The Bible does not make a clear statement on that–but it may happen (see also The ‘Lost Tribe’ of Reuben: France in Prophecy?). The USA and the UK have long been considered the bastions of Protestantism. The EU is not going to forget Brexit or Donald Trump, nor is it likely to forget and forgive the USA for what Steve Bannon is trying to do. Despite having problems of unity (Daniel 2:41-43), the Europeans will one day reorganize and follow a leader that the Bible also calls the Beast (Revelation 17:12-13). Steve Bannon, Donald Trump, Brexiters, and other English-speakers will not stop that. And this will not end well for the USA, UK, and their other Anglo-Saxon descended allies. This entry was posted on Wednesday, July 25th, 2018 at 7:00 am	and is filed under Prophecy. ‘EU trade commissioner Cecilia Malmstrom set out plans to retaliate against the proposed US tariffs.’ Did Steve Bannon just tell Europe to implement 666?